Galaxy Note 4 has the best camera (both software and hardware) among all Samsung smartphones and tablets. The 16MP main camera with OIS, Fast Auto Focus and Live HDR(Rich Tone) can take nice pictures in most lightning conditions. The 3.7Mp front camera with 120-degree wide selfie mode can meet all your requirements for selfie and online communication. The revamped camera app makes it simple to use the camera on Galaxy Note 4. Most Galaxy Note 4 owners can take outstanding photos by simply tapping the shutter button without doing anything else. But for some Galaxy Note 4 owners, they may want to get more controls. Occasionally, you may want to take som picture with special effects,e.g., for your kid’s basketball game. In these scenarios, you need play with some camera settings. Galaxy Note 4 camera guide is here to help you. For some new Android users, the camera app may be still a bit confusing. So, we created this Galaxy Note 4 camera guide page. We put our popular Galaxy Note 4 how-t0 guides that are related to camera usage into this page for fast access. We hope you enjoy these Galaxy Note 4 camera guides. If you have any questions or problems not covered in these guides, please feel free to leave them in the comment box below. We will add more Galaxy Note 4 camera guides regularly. 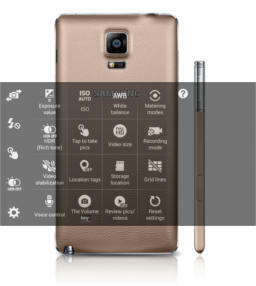 How to change the storage location for photos and videos on Galaxy Note 4? We hope Galaxy Note 4 camera guide page can solve some of your problems you may encounter when using Galaxy Note 4 camera. If you find your problem is not covered in any guides, or you have some questions are not answered, please let us know by leaving a message in the comment box below. We will try to help you find the solution. For other features or other problems with your Galaxy Note 4, please check our Galaxy Note 4 How-to guides.